Got an hour or two to kill before taking your Eurostar, don’t want to go too far? Here are 23 ideas to kill time, have fun and get to know the area a little better. There is so much to see! Too many suitcases? You can leave them at the left luggage section of the Excess Luggage Company. 1. Have a look at the fun science exhibitions at the Wellcome Collection – always a cool twist on the theme. 2. Did you know the British Library has a few original Beatles lyrics on show? 3. See an exhibition in the crypt of a church. 4. Enjoy a whisky at The Golden Arrow, the bar of the nearby Pullman Hotel. They have around 200 to choose from. 5. Play the piano. There are still two left from the Street Piano Initiative from 2012. And you’ll often get to hear amazingly skilled people practising there too. Even Elton John gave it a try! 6. I know, I know, it’s tempting to stock up at Marks & Spencer. It’s easy, it’s cool and it’s right by the Eurostar entrance. But just around the corner is Sourced Market, a rather cool deli with a fab range of craft beer. 7. Plan a bubbly time – at Searcy’s champagne bar, on the first floor of the station. Brilliant view on the architecture. 8. 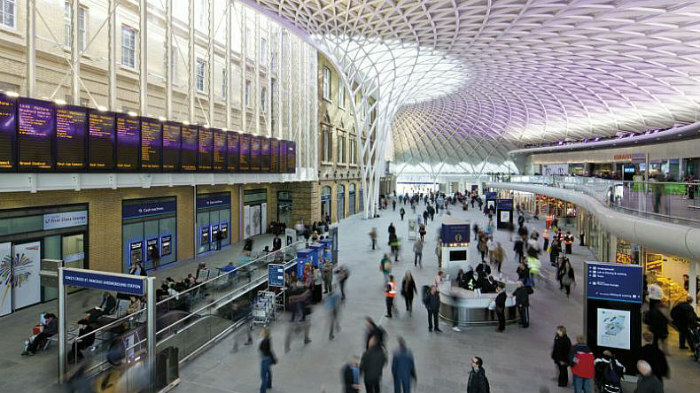 Cross the street and gasp at how beautiful the contemporary arch of King’s Cross Station is. 10. It’s rather discreet but there is a really nice pub within King’s Cross station: The Parcel Yard. Step inside – it’s huge, 2 floors, even a little couryard protected by a glass roof. This is where the mail and packages used to be sorted, hence the name and the themed decoration. 11. Play on a swing. Between St Pancras and King’s Cross is a rather cheerful art piece called IFO (Identified Flying Object): a giant bird cage, lit at night with a swing in the middle. Don’t be shy. There are as many adults as there are children using it. 12. Have a cocktail at the German Gymnasium. The place was build in 1865 and was England’s first purpose-built gymnasium. It even hosted the indoor events London’s first Olympic Games in 1866! It now has Grand Café, a sophisticated first floor restaurant, two bars and an outdoor terrace. 13. Relax on Pancras Square, a peaceful little haven with fountains. A great place with a terrace there >> Drake & Morgan. 14. Go art hunting! The Pangolin Gallery has set up a sculpture trail in the area. Free, simply ask the map at the reception desk. 15. Near King’s Cross is Regents Canal. The nearby path will take you to Camden in 30 mn. 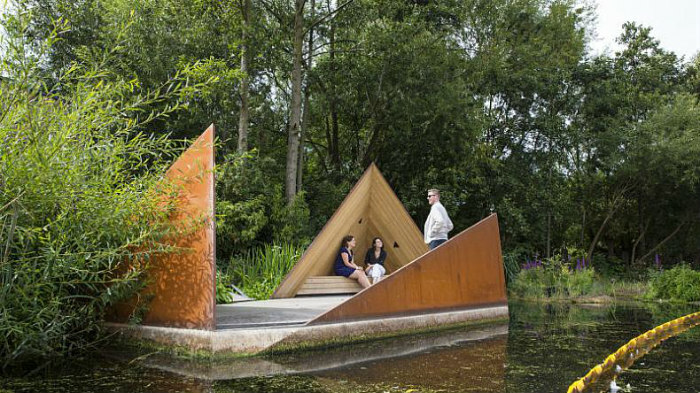 You could also check out Camley Street Nature Reserve and its funky floating observation point/contemporary sculpture. 17. Take the kids to Granary Square to play in the 1,000 choreographed fountains or to Lewis Cube Square nearby for its arching water jets. 18. 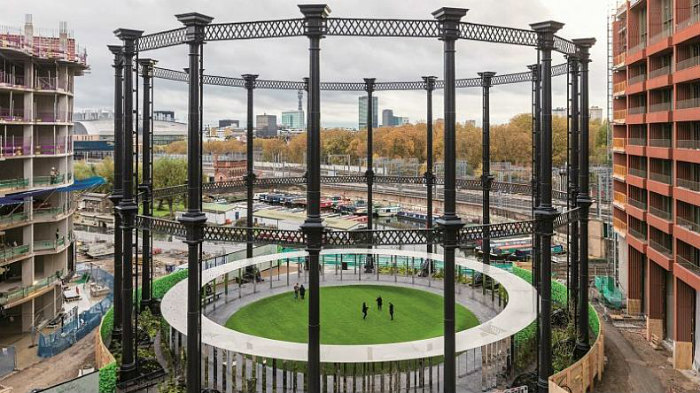 Fancy a picnic by the canal, near Granary Square? Stock up on treats at the nearby Waitrose (they even have a wine bar). A wake-up-your-senses coffee? Then go to Caravan (the beans are roasted on site and they serve meals too). A gourmet lunch/dinner? Grain Store is sure to wow you with its daring twist on recipes, Dishoom makes fantastic Indian dishes (and if you have a chai, it will be refilled for free as many times as you wish). More of a street food fan? 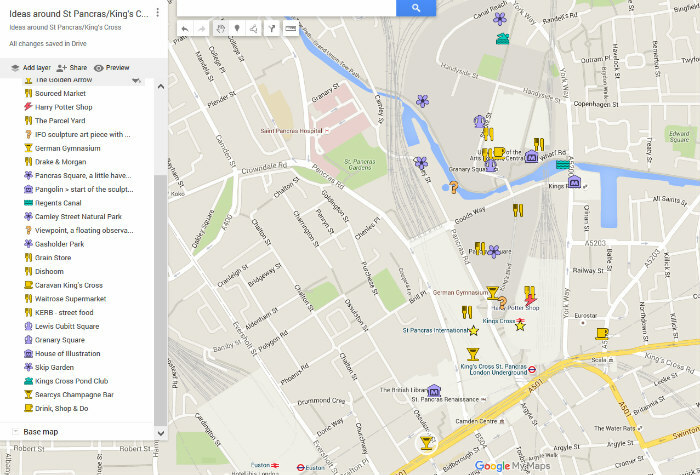 Try Kerb nearby, Wednesdays to Fridays (noon to 2pm). 19. Dream at the House of Illustrations – a museum featuring the work of famous artists that made us dream all our childhood. Their gallery is dedicated to Quentin Blake at the moment. 20. Go splash at King’s Cross Pond – a natural swimming pool a mere 15mn from the station. You will have to book a space in advance on the website to enjoy it fully but you can also get a fab view on it from the viewing platform. 21. 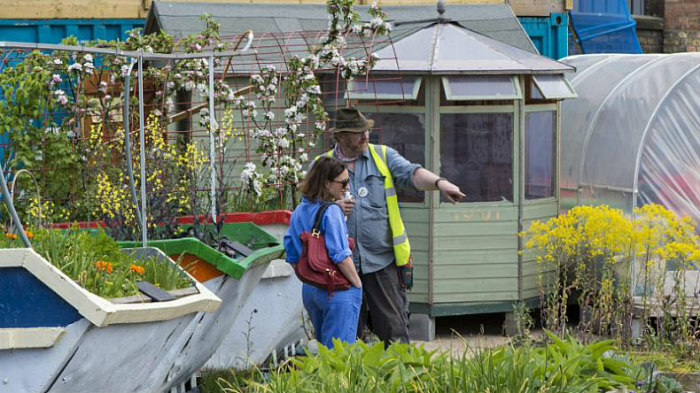 Wander through Skip Garden, recycled container now presenting gorgeous flowers and herbs. Urban poetry. They have a little café too. 22. You can even play ping-pong for free in the Granary Building. 23. Vintage inspired café by day, bar by night – impossible not to fall under the charm of Drink Shop & Do. Let alone the counter is loaded with cakes. They organised really funky workshops in the evening. And there’s dancing on Friday and Saturday nights!